Easily grown in average, medium moisture, well-drained soils in full sun. Prefers organically rich soils. Tolerates some light shade. Plant bulbs 4-6” deep and 4-6” apart in mid fall. 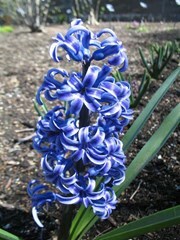 Best planted in mass or in clusters (e.g., 6-15 bulbs). Soils should be kept moist (particularly if soils are dry) immediately after planting to encourage root growth. Also keep soils moist during the spring growing season, but taper off moisture after bloom as bulbs head toward dormancy. Promptly remove spent flower spikes so plants do not need to expend energy on seed production. Bulbs are commonly grown in containers, especially when forced for indoor winter bloom. Hyacinthus orientalis, commonly called hyacinth, Dutch hyacinth or garden hyacinth, is a spring flowering bulb that produces spikes of flowers noted for their intense, often overpowering, fragrance. Typically grows 6-10” tall. Each bulb sends up 3-4 strap-shaped green leaves in early spring and a stiff densely flowered spike of extremely fragrant tubular flowers. A very large number of hybrid cultivars are available in commerce under this species name in flower colors including various shades of blue, purple, pink, red and white. Genus name of a god associated with the rebirth of vegetation like Adonis. Specific epithet means from the Orient. NOTE: Images displayed on this page are of hybrid cultivars not the species. No serious insect or disease problems. Bulb rot may occur in poorly drained soils. Wear gloves when planting bulbs to avoid possible allergic skin reactions. Flowering often decreases in quality after the first year, and bulbs may need to be replaced every couple of years. Group or mass in beds, borders, rock gardens, along walks. Effectively mixes with other spring flowering bulbs. Containers. Force bulbs for indoor winter flowers.